Ill at Will breakdance crew is excited to be opening for the Improv All-Stars show at Centennial Hall in London. We’re looking forward to performing in front of our home town crowd on Tues, Aug 18 at 8 PM. Colin Mochrie and Debra McGrath make their first appearance in the Forest City with local troupe Shut the Front Door Improv at Centennial Hall on August 18th, in support of Crouch Neighbourhood Resource Centre. STFD Improv is gearing up to host their second annual Improv All-Stars show, which, funnily enough, promises to be a night of firsts. 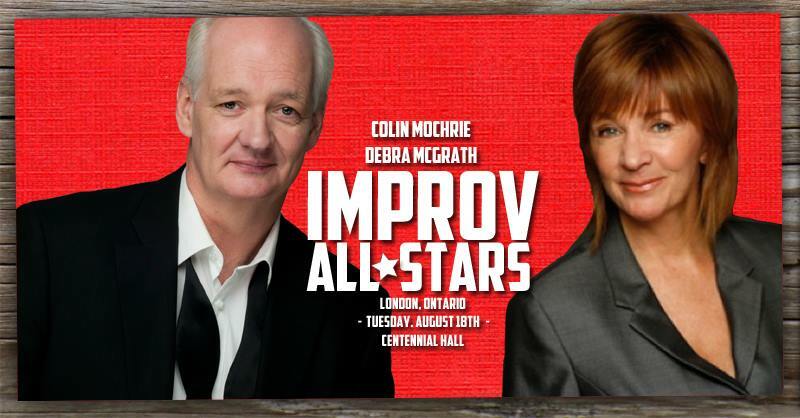 Canadian improv stars Colin Mochrie and Debra McGrath will join STFD’s cast for a night of comedy at Centennial Hall on August 18th. Bob Derkach will serve as musical director for the evening. Mochrie is best known as a permanent fixture on Whose Line Is It Anyway?, while McGrath wrote, directed, and performed at Second City and has appeared on numerous television series, including Little Mosque on the Prairie, Babar, and Franklin. The two are preparing for an upcoming tour in the UK. Derkach has performed on Drew Carey’s Improv-A-Ganza, and served as musical director at Second City mainstages in North America from 1983 to 2006.